Tech is ready to begin his pony hunter career. 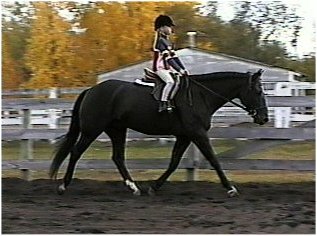 He has a very good hunter under saddle trot, balanced canter, cute jump, and now does his lead changes. Previous to our owning him he was used for beginner lessons where children learned their basics and went to some local shows. 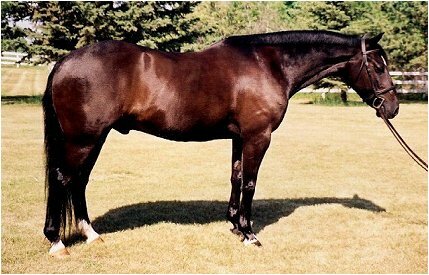 He is well-mannered in crowded rings and hard to miss due to his movement, schooling, and considerably dark color! Tech is currently jumping 2'6" courses at home and easily has the scope to do 3'. We have used Tech regularly in flat lessons with an 8-9 year old and he has hacked sweetly for a 7 year old (who weighed only 45 lbs.). He has also been schooled over fences in lessons 2x per week with an older junior. 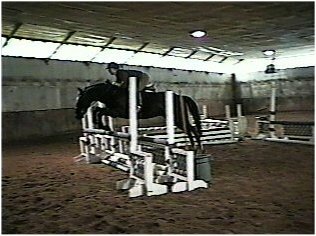 Tech gets ridden 4-5 days per week on average and shows a good work ethic. Congratulations to Tech's new owners in California, USA.